Taipei's mayor says a major event in three years will put the spotlight on the country. Today Taipei Mayor Ko Wen-je signed an MOU to host the 2021 Rotary International Convention, saying it represented tremendous publicity for Taiwan. Meanwhile delegates from Shanghai will arrive in the city next week for the annual Taipei-Shanghai Forum, which is proceeding despite cross-strait tensions. Mayor Ko Wen-je met with members of the local Rotary Club, posing together with the group for a picture. Taipei will host the 2021 Rotary International Convention, which is expected to bolster tourism as some 40,000 club members gather in the city. This is the biggest form of publicity for Taiwan. It’s even better than placing an ad in CNN. This will be tens of thousands of people posting about Taiwan on Facebook, and they’ll be doing it for 10 days. The Rotary Conference will be a big event for the city, but for now the mayor has the more pressing matter of the Taipei-Shanghai twin cities summit, which opens on Dec. 19. 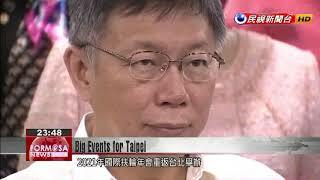 A delegation from Shanghai will arrive in Taipei next week. We went to meet with the Mainland Affairs Council. They said that this time around, they will be adopting a more… I guess you could say a “wait and see” approach. They did not make any demands on us. In addition, Ko announced that he would be participating in next year’s Dajia Mazu pilgrimage, taking part in the entire journey. It’s to make good on a promise he made before his election, he said. When asked if he wished to win the presidency in 2020, Ko laughed it off, saying it’s not good for a person to have too many wishes. But already there are rumors that his Mazu pilgrimage will be a way for him to gauge his popularity elsewhere in the nation.